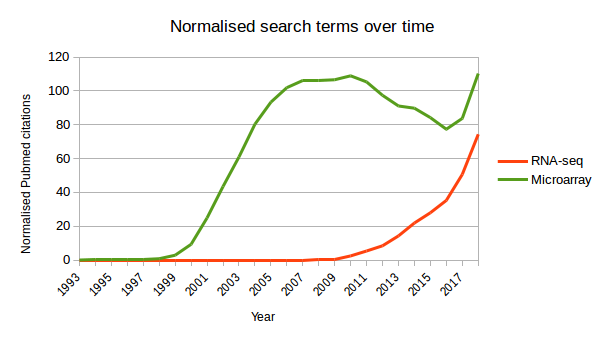 We know RNA-seq has a number of advantages over array based analyses, but is RNA-seq taking over in terms of number of datasets published? 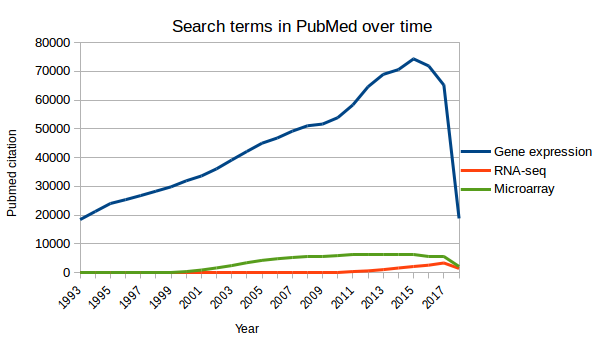 I got curious and thought I'd investigate with some PubMed searches. 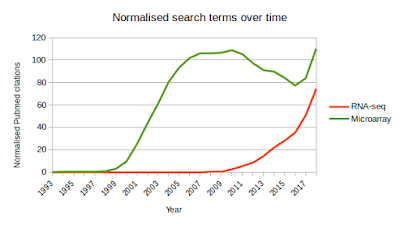 I searched for "RNA-seq" and "microarray" and downloaded the CSV file which summarises the number of citations per year. As a type of control, I also searched "gene expression". I divided the yearly "RNA-seq" and "Microarray" citation counts by the "Gene expression" counts then multiplied by 1000 to give the numbers seen below. 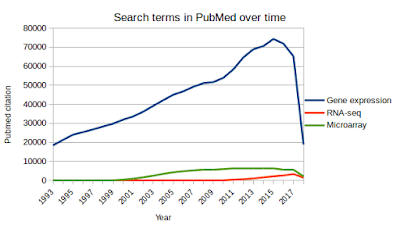 You can see that microarray is still more frequent in PubMed as compared to RNA-seq, but the gap is getting much narrower and the cross will likely occur in the next two years. Back in 2015, our group described DEE, a user friendly repository of uniformly processed RNA-seq data, which I covered in detail in a previous post. Ours was the first such repository that wasn't limited to human or mouse and included sequencing data from a variety of instruments and library types. The purpose of this post is to reflect on the mixed success of DEE and outline where this project is going in future. In our RNA-seq series so far we've performed differential analysis and generated some pretty graphs, showing thousands of differentially expressed genes after azacitidine treatment. In order to understand the biology underlying the differential gene expression profile, we need to perform pathway analysis. We use Gene Set Enrichment Analysis (GSEA) because it can detect pathway changes more sensitively and robustly than some methods. A 2013 paper compared a bunch of gene set analyses software with microarrays and is worth a look. Generate a rank file The rank file is a list of detected genes and a rank metric score. At the top of the list are genes with the "strongest" up-regulation, at the bottom of the list are the genes with the "strongest" down-regulation and the genes not changing are in the middle. The metric score I like to use is the sign of the fold change multiplied by the inverse of the p-value, although there may be better methods out there (link). In the last post of this series, I left you with a gene expression profile of the effect of azacitidine on AML3 cells. I decided to use the DESeq output for downstream analysis. If we want to draw a heatmap at this stage, we might struggle because the output provided by the DEB applet does not send back the normalised count data for each sample.